Fabrics, in sometimes bold colours, such as these silks, are becoming a prime source of texture and colour in superyachts. 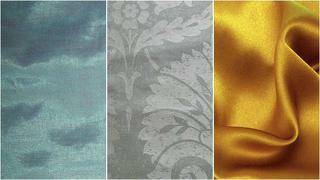 The leading yacht designers of our time are able to create masterful narratives by virtue of the colours they choose. Their palettes tell the story of the yacht and the experiences meant to take place between its bulwarks. The owner’s expectations drive the intricate plots of these narratives, though there are a great number of sub-plots bringing these stories to life – the inspiration of classic colour schemes, the impact of advanced materials technology, the seductions of runway fashions, the excitement of automotive styling and so on. All of this action, of course, must take place within the limits of time and space on board: How a person actually experiences a walk from aft deck to dining area; how she or he perceives the height of stateroom ceiling, or ‘reads’ how to progress easily from the salon to the skylounge bar. The nature of the stories being told by yacht designers with various colour palettes has been changing over the past few years. Some critics would say they have been changing dramatically. Where at one time the idea was to express a degree of majestic power, the current narrative places far more importance on relaxation via the total absence of colour, a technique championed by French designer Rémi Tessier. Also, today, many owners are saying they would now prefer a kind of floating beach club or spa over the floating palace of only a few years ago – ‘Give us less show and more sand!’ This doesn’t mean that the standards of luxury and elegance should be lowered an iota, it is just that owners now want to enjoy those things with or without shoes. How designers actually pull off this laid-back luxury in their colour schemes is the subject of our inquiry. The challenge for designers is how to coax a more laid-back palette into a lasting narrative everyone can be proud of. The challenge, too, is unique to yachts. You cannot just copy a land-based beach club. Unlike land-based structures, yachts are in constant motion. The sun is forever changing position, reflecting up from the water as well, massing unexpected highlights and shadows – turning a lovely blue-green bulkhead fabric to a sickly green if one isn’t careful – or lacquered white salon mullions into a source of painful glare. To complicate matters even more, the shifting spaces of even the largest yacht can feel uniformly small compared to the land palace back home, which can put dark colours on the list of questionable content. 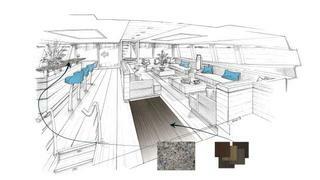 How, then, are yacht designers responding creatively to these complexities when it comes to colour choices?